Spotlight on a sport-inspired culture. Updates and trends to ignite your creative spark at work and in life. Can You become a Smart(er) Sleeper? Tools and motivation for leaders and experts. Be more productive. Propel your career. Become a business MVP. Looking to raise your game on a daily basis and strive to be the MVP in your team? Sometimes it just takes small changes to meet those challenges head on. Think like an athlete. Reach your full potential with a pioneering spirit and winning attitude powered by sport. Need to figure out your next off-field move? Our experience in talent scouting and getting the best out of our players can help. Creativity in action. Unlocking the imagination and cracking the code behind big ideas and innovation. You are almost done. We sent you a confirmation email. Please click the activation link within the email to complete your subscription. It seems like the email address ##extra## has already been registered. If you cannot find the confirmation mail in your inbox, please check your spam folder or contact us. Oh no! An unexpected error occurred. Please try again. Search starts after entering three characters. Your search did not score a hit. Try again. Check your spelling or use different terms for better results. Endurance athlete Lee Ryan talks about how self-achievement goes hand in hand with being a good husband and father. GamePlan A readers in Dubai will recognize Lee Ryan or possibly his preferred training partners…his two daughters! They’ve covered a marathon together plus all the hours of training that went into performing on the big day. He’s a trainer for our adidas Runners community in the UAE and constantly being asked about balancing family, business and fitness. The questions today come from my colleagues at adidas Dubai. What Guinness World Records do you currently hold? How did you get into sport? I didn’t enjoy sports as a boy. I rode my bike and played football with friends, but I never really got involved in team sports. Then one day picked up my Dad’s gym weights in the garage and you could say the rest is history. I was a naive 18-year-old when I ran my first marathon in London, and that’s when I fell in love with the sport. What’s the fitness lesson that you learned as a child that you’ve had to unlearn? If I was to unlearn anything, it would be to realize that you should be patient enough to work for long enough to see the results. It doesn’t happen overnight! What diet do you follow and how does your family help you stick to your routine? I love food! I cook all my food for me and the family every night and prep lunches for the next day. We try when we can to sit down and eat the same food at the same time. My food routine is fairly simple; I eat what I enjoy and I eat what allows me to perform. I eat lots of fruit and vegetables, red meat maybe twice a week max, lots of fish and chicken. Carbs are not my enemy either, so plenty of rice and pasta to run my training weeks. When I get closer to race days, I tighten the reins a bit more on the food and make better choices with the snacks. I have a massive sweet tooth that I battle, but at the same time I don’t hate myself for having the odd chocolate bar. How do you balance your family, your job and your fitness to maintain your standards in all three? It comes down to prioritizing the most important things and making some sacrifices. Quiet time is something I never thought I would miss. To read a book or listen to some music. With kids, work and everything that comes with it, life is a loud! What advice do you have for parents who struggle to make time for exercise while balancing a job and family obligations? There is always a way, and teamwork is key. You don’t have to find hours and hours. So, when the kids are napping, give yourself 20 minutes to do a small run or circuit. If the weather allows it, go and push the stroller outside take some time to get your heart rate up while you push in the park. Use a bench for steps ups, or bring some small weights in the base of the stroller. Depending on how young your kids are, you can also find a way to play with them in the house with workout videos or dancing. What is your greatest achievement? I would have to say becoming a father! But also, being a five-time Guinness World Record holder is amazing. The realization that I am the only person in the world to have these records is sometimes something I cannot get my head around. My family has been through a lot of trauma over the last few years so that has been the catalyst driving me to become a world record holder. Pushing myself through the challenges is my avenue for reflection and grieving. Running allows me to escape but it has also helped to share my story with others to inspire them to turn sadness into motivation. What is your next conquest? 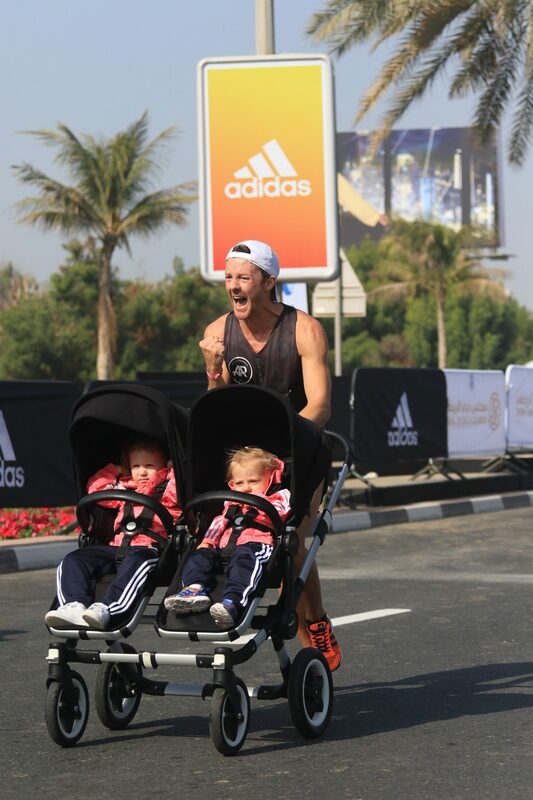 To make it to tomorrow, and to be the best I can be in the moment as a husband, father and coach to the Dubai community of adidas Runners. As a full-time, active, and working father to two Girls (3 years and 20 months), every day is a new challenge. I have the Chicago marathon in October and maybe another world record attempt in December for “Fastest Half Marathon with a Double Stroller” to follow on from my success in the Dubai marathon in January. Notify me of follow-up comments via email. Subscribe to your regular digest of GamePlan A content. Please take note of the commenting guidelines. You will receive an email to approve your comment. You will receive an email to approve your comment. It will only appear after your confirmation. Oh no! An unexpected error occurred. Captain! Don't see him as much as I want to, but when he's around, there's always some fire to keep going! I look forward to being like him every single day! For today, let's just say the thought of putting in at least 15 to 20 minutes of a run has come to me, after reading this! Great to hear that Lee's story has motivated you to start running. Start easy, don't set overambitious goals (learn more here: https://www.gameplan-a.com/2018/02/you-want-small-wins-not-six-pack-abs/) and just enjoy the fact that you are active regularly. Once you're in a routine, you can increase your goals step by step. WARM-UP DONE. READY FOR MORE? Get on the list for fresh stories, tips, and challenges every week. Plus, download our free weekly planner to crush your goals. The GamePlan A newsletter is brought to you by .